We took a family vacation to California last week. The first day we were there we went to the beach. Andrew had so much fun playing in the sand and the water. He also loved chasing the seagulls up and down the beach, which was so funny to watch. 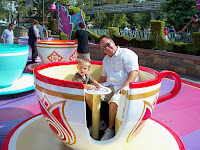 We spent a few days in Disneyland and Disney California Adventures. Andrew had so much fun meeting all of the Disney characters, going on all of the rides, and watching the parades and fireworks. 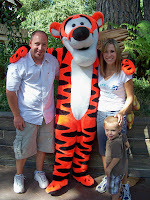 We had so much fun watching Andrew's excitement over every little thing. He was pretty much running circles around us the entire time we were there! We had a lot of fun and it was great to spend time together. 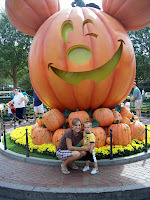 Andrew is already asking if we can to back to Disneyland and see Mickey's Castle!